A splice at 133. A splice at 157. A splice at 207. "I just made a GIF of frames 154-166. All you have to do is watch the little girlRUNNING in the upper right corner (I think her name is Rosemary). She runs very smoothly in this GIF - no jumps...no hidden or missing frames...no stutters. The car is basically gliding down Elm Street at a constant speed, again, smoothly and like it should. Also, look at the guy taking pictures and he has one leg on the street and thenSTEPS back onto the curb (near the girl). Again, smooth motion. Once again, how many frames are missing from this segment??? = 2.4ft = distance between JFK and Connally in limo. 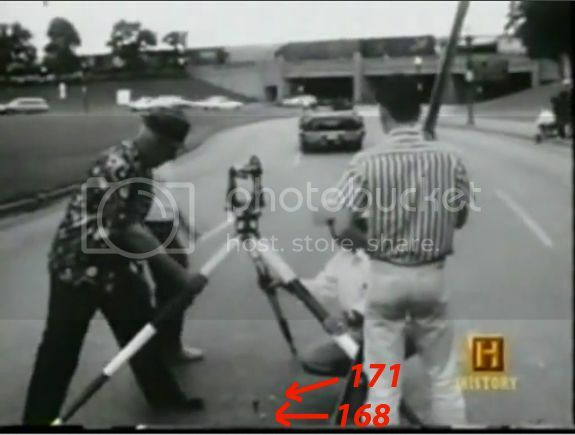 Let's get rid of the distance (z161-z166- 2.4ft-true distance between JFK and Connally) in terms of a 48fps film. This leaves us with a matching distance of 20.65ft. Frames missing? In a jogging clip that has absolutely nothing to do with the Zapruder film? There's simply no comparison between the two. I know you're putting a lot of effort into this thread, but you're really reaching for something that isn't there. You keep parroting your belief. It is well known by now. I don't need to argue the validity of the film. I gave an example of the zfilm with 3x the frame total for a particular span. Refer back to post #21 and compare it to this, which now possess' 1/3 of those original frames. Move on from this topic, start your own on the merits of the extant zfilm being unaltered. Math doesn't reach, but the eyes are prone to deception. OK, Chris, OK. I don't think any amount of logic or sane reasoning will convince you of anything otherwise. You continue on with your thread here. I agree that Math proves results. But the only way it does that is if one's hypothesis is correct in the first place - Math just confirms things. What you're trying to do here - your hypothesis - is flawed so therefore no amount of Math will help. I prefer the WC jigsaw puzzle. Pieces provided via CE884 and video. When did the limo travel 3.74 mph? What exactly is "flawed" Michael? The concept that a film exists in the Archives which is currently in 9 pieces? 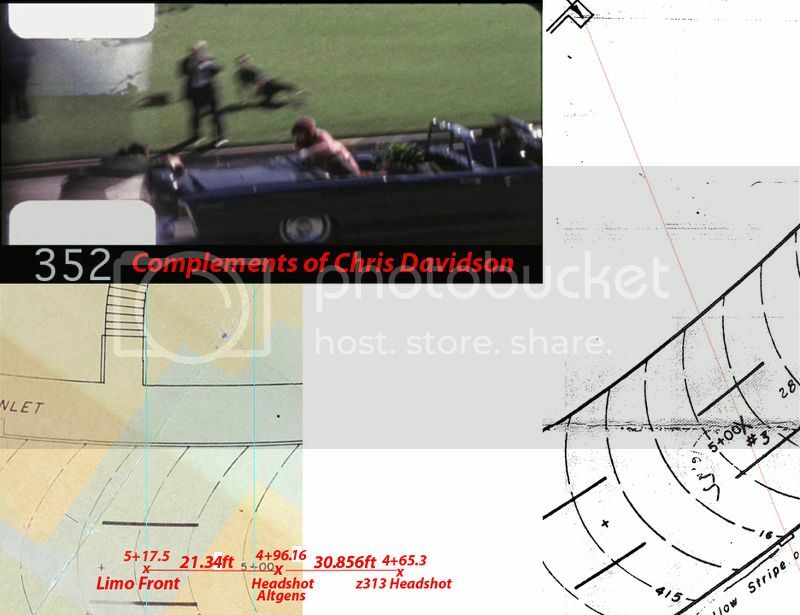 That the 6+ second portion showing the assassination has nothing which identifies it as film #0183? This is the Film Map of the supposed "unaltered" original... what part of this map convinces you this 30 foot side B of film which now contains over 45 feet of film - is an unaltered original? Referring back to the previous post, I can just imagine the conversation among Shaneyfelt and Robert West at this point. Shaneyfelt: Robert, if you don't plot these two frame numbers here, my synchronization masterpiece will become invalid. 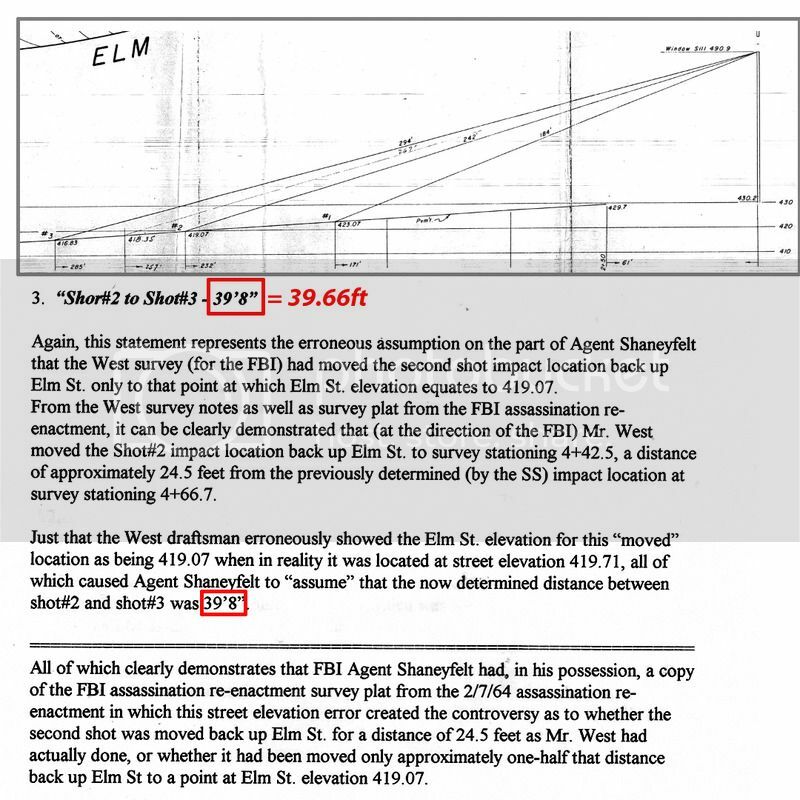 West: Shaneyfelt, why did you guys hire me in the first place, you have the surveying well under control. You do realize that note was written 34 years after the film was recorded by a government beauracrat? 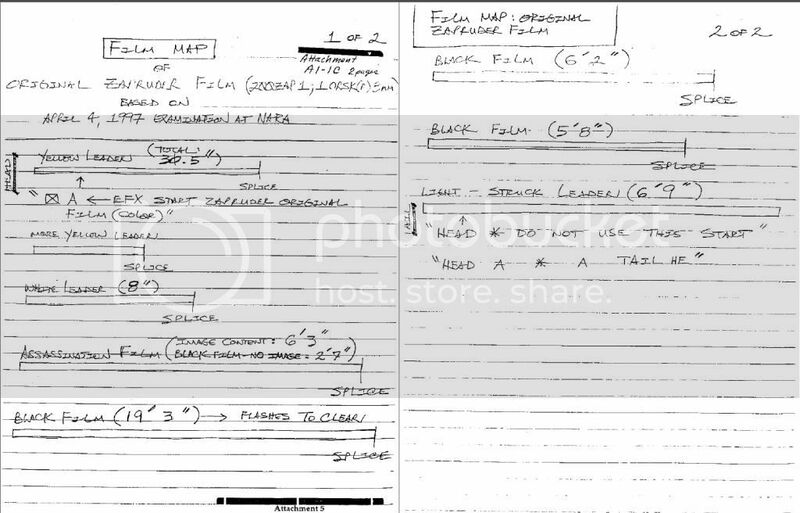 I mean, why go by a bunch of scribbled notes? Go to post #63 above and work with the best evidence - all frames of the Z film. Download them, import them into your favorite video editing software, blow them up, scrub your timeline and look at each of them one frame at a time. There's nothing to see. Everything looks like it should - the movements of the people walking, stepping, waving, and so on look like they should. Even look at the flag on the front of the car. It'd be extremely difficult to fake a flapping flag with its unpredictable waving motions. And the faking would have had to have been done in 1963 with rotoscoping, which was non-existent at the time. They would have had to hire Hanna-Barbera to animate the flag (smile). Look at other posts I made about the SS reenactment film that includes one of the earliest copies of the Z film. It looks exactly like the frames you see that you can download at post #63. In a previous post here, I was told I was "parroting" my replies. Well, yeah, what do you expect? There's only so many ways you can say that there was no need to forge the film and for that very reason, the public didn't get a chance to see it until 1975. That's why the film is one of the best pieces of evidence of the case. It may be hard to believe but not every single piece of evidence needed to be forged in this case. 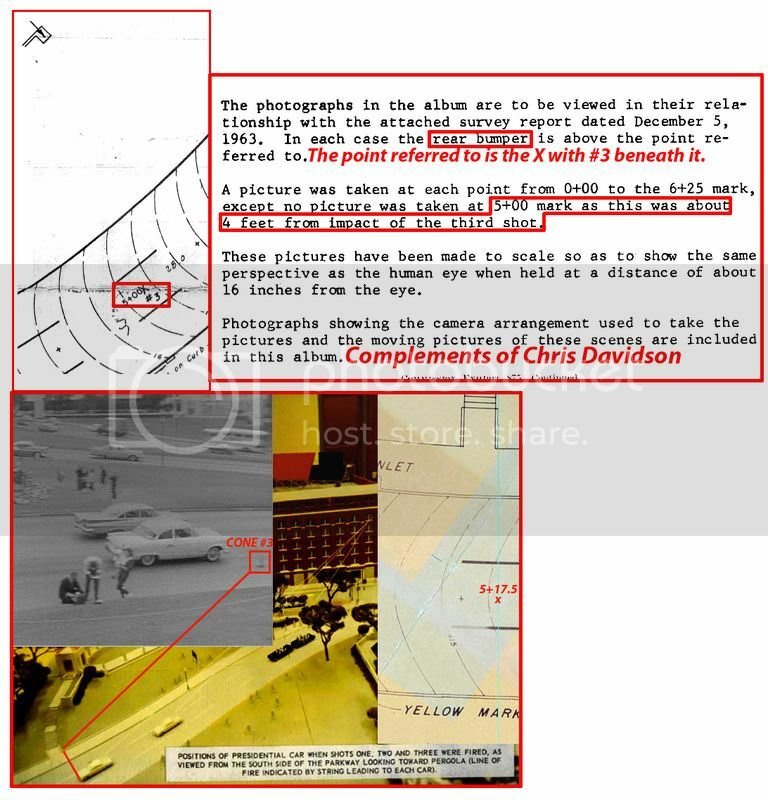 One piece of evidence I do believe was faked was the back yard photos, and there was quite a bit of faking on the mail order of the rifle. But the Z film was simply withheld from the public while at the same time the disinformation campaign started about it soon after (like Rather saying the president's head fell forward at Z313). It appears you've created a conundrum for yourself. 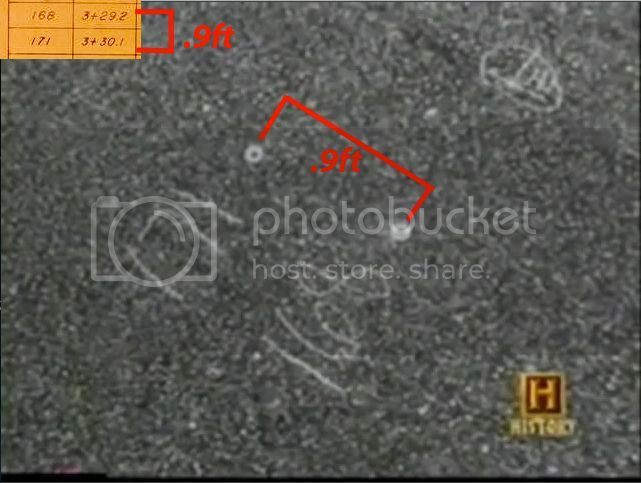 According to the extant Zfilm, JFK's head does fall forward at z313. How can Rather's disinformation start when it equates to existing events within the extant zfilm, which you believe to be unaltered? Please, I ask again, start a new topic on the unaltered zfilm. My topic is Math. If you have a problem with the Math, feel free to point it out. P.S Just one of the many gifs I've created using the extant zfilm, frame by frame. Yes, Chris, he says it falls forward and it does. But what speaks much, much louder is what he did NOT say - that his head is then thrown violently backward. As a reporter reporting, his obligation to his audience was to report *everything. * Thus, the disinformation had begun at that point. I plan to start an "unaltered Z" thread when I'm ready. The rear bumper represents the location(Station#) of JFK within the limo, which equals a shot impact location(Station#). The front bumper is represented by the pylon. How would you know what the distance is between these two points? Hint: Look at post #3. The length of the limo is 21.34ft. Altgen's said he was approximately 15ft away at the last shot. Elm St. lanes were how wide? I'll let you figure that out. Since Altgens is somewhat behind the curb, at extant z352, add that to the lane width and compare with Altgens estimation. The distance between the extant z313 headshot and the Altgens headshot is exactly 30.86ft. This next attachment is from Tom Purvis. My input is the red boxes and the conversion to 39.66ft. Shaneyfelt adjusting down the street. 39.66ft - 30.86ft (distance between z313 and Altgens shot) = 8.8ft. The speed of the limo from z154-z166 is (23.05ft per sec) 15.68mph. What else does 8.8ft indicate? Just putting this comparison into the context of whole frames, as I don't know of any frames that consist of .3 images. Well, maybe some that were artificially created.